D-Log: Santa, All I Want is Peace and Quiet! Santa, All I Want is Peace and Quiet! I'm tired! Been working all day. I cooked, did laundry, cleaned the desk, cleaned the med cabinet, started the tree decoration, etc., etc., etc. Now I'm sipping my calming herbal tea, and hoping to be able to take a nap soon. What's up with the kids today? They can't stop talking at all... All I'm asking for is some minutes of peace and quiet where I don't hear a sound and I don't have to answer any of the non-stop questioning! Ma ma mia! OK, nothing seems to be working and questions and requests for attention are pouring on me as I'm writing this... mama mia! 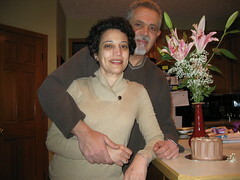 December 10, Thursday, was our 11th anniversary. I didn't have anything on mind or planned on anything. But when I came home, Tala greeted me in the garage and ordered me to close my eyes while she guided me inside. Inside, she handed me a card she made and I found a vase of my favorite flowers (stargazers or oriental lillies) and a cake from my favorite bakery! What a wonderful surprise. Then all 3 dragged me out to go have dinner. It was very nice and warm. Last Thursday, Moody had an event at school about the Railroad Underground movement. 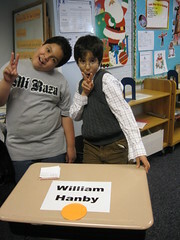 He was playing William Hanby. Sol attended, I could not since it was during the day. In the same evening Tala had her Holiday Performance at school. She read a poem about Eid that the teacher came up with. It was a nice touch of the school and the first year we don't have to argue with them about not being all inclusive. Yesterday we got the tree. The kids are so worked up and hyper wanted to decorate it right away. We didn't. instead we went to watch Avatar in 3D. Great, great movie; I highly recommend it. It was 2hrs and 40min long, but not boring at all. Today, of course the kids started decorating the tree before we got up. I asked them to take all the ornament down so I could put the lights and streamers first. Appearently, they got bored and decided to take all the tys out of the 2 humongous toy boxes in the basement. After fighting with them so many times, they are now taking 15-minute turns. One cleans the toys, while the other decorates the tree, then they switch and so on. I am NOT doing any of that! The weekend is over, and I didn't get to rest like I wanted to... again! Well, at least the atmosphere is festive inside and outside the house. I forgot about Eid! We had a good one again. Suhir and I took Tala and Rayann to Sweet&Sassy for manicure, pedicure, hairdo, and makeup. They had a blast. We also got together with 2 other families and had fresh Eid 3esban, yum yum! No, gurma and herbal tea don't mix. I literally zonk out after the herbal tea! Enquiring minds want to know: Are you coming this year?